Most ULINK2 issues can be fixed by following the steps below. Complete the checks and answer the questions before contacting the support team. 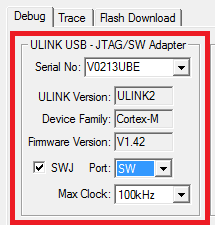 Only one ULINK2 is connected to the PC. The target system meets the IO voltage range of ULINK2 as described in Technical Data. If possible, test one of the Keil example projects on a standard evaluation board. Use a target system that is known to be working. ULINK2 is not connected to the target system. ULINK2/ME Cortex Debugger for Cortex-M0, Cortex-M1, Cortex-M3, Cortex-M4, and Cortex-M7 devices. ULINK2/ME ARM Debugger for ARM7 and ARM9 devices. Infineon XC800 ULINK Driver for Infineon XC800 devices (PK51). ULINK Driver for XC16x for Infineon XC16x, XE16x, and XC2xxx devices (PK166). If the Serial Number and Firmware Version is visible, continue with the next step. If Serial Number and Firmware Version are blank, continue with Hardware Checklist. Connect the target system to ULINK2 using the supplied ribbon cable. Ensure that pin1 of the connector matches the red stripe on the ribbon cable. Ensure that the target system is powered ON correctly. If the JTAG Device ( or SW Device) list box contains an ARM Device Name and IDCODE, continue with the next step. If the JTAG Device ( or SW Device) list box is blank, or contains an error message, for example SWD Communication Failure, continue with Target Checklist. ULINK2 is communicating with your target system. In case that error messages appear during a flash download or a debug session, refer to Error Messages.